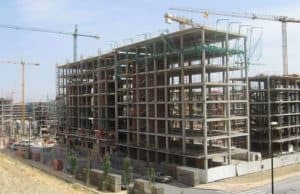 Due to the lower compressive strength of bricks (For 1:2:4 cement concrete works), the width of load bearing walls for the building having more than four story becomes extremely thick and for such cases, RCC framed structures are suitably adopted. Framed structures are generally of two types. 1. In RCC framed structure building the floor area is normally 10% to 12 % greater compared to a load bearing walled building. hence, this type of building is preferably economical where the value of land is very high. 2. It is very easy to alternate the interior plan of a room, bathroom, W.C etc by changing the actual position of the partition walls which ultimately gives more freedom in planning. 3. Monolithic construction can be adopted for resisting shocks and vibrations more effectively than load bearing walled buildings. 4. Normal earthquake effects can also be resisted by providing required further design. 5. Faster construction work saves time, early finishing. 6. No matter the soil is soft or hard, RCC framed buildings can be established anywhere. 7. Maintenance cost is also minimum which can be ignored. Also Read – RCC Beam And Slab Floor.